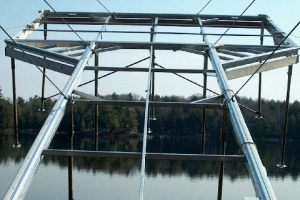 Over the last 10 years I have had the pleasure of purchasing a Boat Lift, Pole Dock and Tower Dock from On the Water Designs for my Cottage in Temagami. I have found Dave MacDonald and his staff very knowledgeable and helpful. The quality and price of their systems is excellent and they always stand behind their product. I have recommended this business to my personal friends and would suggest anyone looking for a premium product at a reasonable price drop in and talk to them.